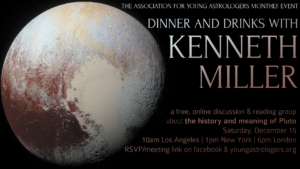 Join AYA for our special discussion with Kenneth Miller on Saturday, December 15, about how astrologers debated and initially disagreed about Pluto’s meaning after its discovery on February 18, 1930. This session is envisioned as a special reading group. We’re asking everyone to read Kenneth Miller’s article “Pluto’s Weird History: Dumb luck? Dumb note? Dumbell?” in the the 2nd Volume of The Ascendant, the Official Journal of the Association for Young Astrologers. This article introduces readers to the fierce debate among astrologers about how to incorporate this new discovery into astrological practice, and how to assign its significance and meaning. You can order your copy directly from Revelore. But in order to allow time for shipping, please place your order with Revelore by Midnight (PST) on November 21st. 100% of proceeds benefit AYA. If you wish to order a copy of the Ascendant after 11/28, you can order through Amazon and use one of their expedited shipping options. The Ascendant is a Print-Only Publication. Kenneth Miller’s article is not available online. As always, this event is free and open to everyone.